C. arguta has long hanging stems that can reach two meters or more; C. ‘Midget’ was developed from shrubbier species. Like all Columneas, C. byrsina has opposite leaves but is one of those that demonstrates anisophylly. Young growth has opposite leaves, with one member of the pair much reduced in size. It eventually withers and drops off, leaving a single leaf at each node. 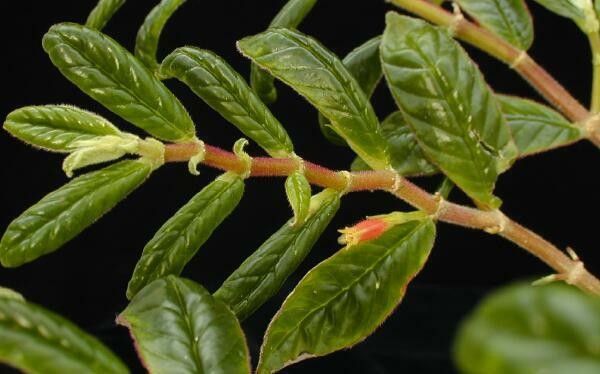 Leaves in Columnea are opposite, meaning there will be a pair of leaves across from each other on the stem. However, many species exhibit what is known as anisophylly, where one leaf grows much larger than the other sometimes to the point of looking like there is only one leaf at each point on the stem (alternate leaf arrangement). Leaves cover the gamut in size and shape from being small, nearly circular leaves in species such as C. colombiana to large, elongated leaves in C. gigantifolia. In many species of section Collandra the undersides of the leaves may appear brightly colored or with “windows” that are somewhat translucent and also brightly colored. The overall effect is a plant that is drab and green when seen from above, but may be brightly colored or show brightly colored, patterned leaves when seen from below. Most species of Columnea can be described as herbaceous creeping plants, sometimes with long hanging stems. They generally do not have thick or erect stems, however some of the epiphytic species of section Collandra can be quite thick and the majority of species in section Pentadenia are terrestrial with erect stems. C. spathulata has fairly small and dull yellow flowers displayed beneath the leaves. 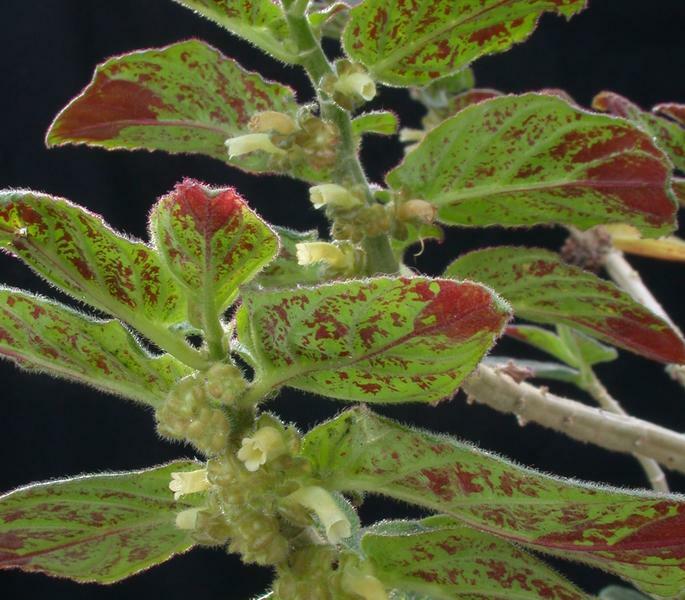 The underside of the foliage is brightly splattered with red, which likely serves to attract the hummingbirds that feed on the nectar produced by the flowers and effect pollination.